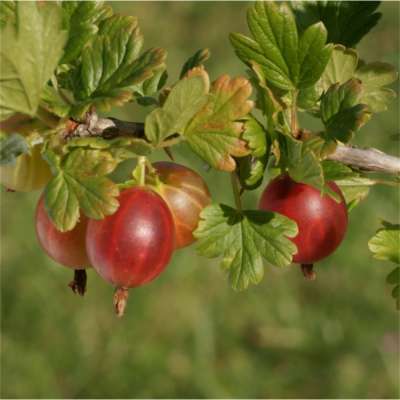 A very old English heirloom Gooseberry; we are delighted to have limited stocks available. The English 'Red Jacket' cultivar stood alone as the winner, primarily due to its superior hardiness (per conversation with Gene Howard, superintendent of the Cheyenne Station from 1964 to 1974). Mr. Howard told me cuttings had been obtained directly from England and that it eventually became his personal favorite due to its hardiness, productivity, flavor andrelative freedom from powdery mildew. He held the English 'Red Jacket' in such high regard that he transplanted it, and none other, to his personal residence before the collection was destroyed. The plant in Cheyenne is extremely thorny with thick, heavy thorns in triplets at each node and bears prolifically, so much that the weight of the fruit has caused the branches to grow in a mounded, almost prostrate form. The earliest known reference dates to 1881 where the 'Red Jacket' took 6th place in the red category at the English National Gooseberry Show held in Manchester. One of its berries was reported to have weighed approx. 1.1 ounces. Berries in Cheyenne were about the circumference of a nickel with 20 to 30 berries per branch. From a reference (J.L. Budd and N.E. Hansen in 1903) it is described as having smooth skin and flesh sweet and good. Budd and Hansen named it 'English Red Jacket' to distinguish it from the Canadian sort.